Gifu (, Gifu-shi) is a city located in the south-central portion of Gifu Prefecture, Japan, and serves as the prefectural capital. The city has played an important role in Japans history because of its location in the middle of the country. During the Sengoku period, various warlords, including Oda Nobunaga, used the area as a base in an attempt to unify and control Japan. Gifu continued to flourish even after Japans unification as both an important shukuba along the Edo period Nakasendo and, later, as one of Japans fashion centers. Before becoming a modern city, it was part of the former Atsumi District, but it has since been designated a core city by the national government. Located on the alluvial plain of the Nagara River, Gifu has taken advantage of the surrounding natural resources to create both traditional industries (including Mino washi and agriculture) and tourism opportunities like cormorant fishing. Mount Kinka, one of the citys major symbols, is home to a nationally-designated forest and Gifu Castle, a replica of Nobunagas former castle. Gifu also hosts many festivals and events throughout the year. Two major rail lines connect Gifu to Japans national and international transportation infrastructure. JR Centrals Tokaido Main Line runs through the city, connecting it with Nagoya, one of Japans largest cities, and the surrounding area. The city has a direct train route to Chubu Centrair International Airport and facilities capable of hosting international events. Gifu has active relationships with six sister cities. As of July 2011, the city has an estimated population of 412,895 and a population density of about 2,000 persons per km². The total area is 202.89 km². Two archaeological sites in the city of Gifu have shown that the area around modern-day Gifu has had residents since pre-history because of Gifus location in the fertile Nobi Plain. The Ryomonji and Kotozuka sites have produced large burial mounds that are representative of the late-Yayoi period, which is when rice cultivation began in Japan. 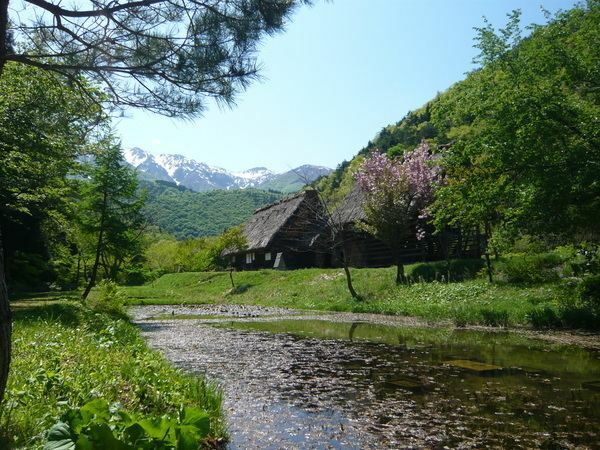 As civilization in Japan grew, permanent settlements began to appear and, eventually, the village of Inokuchi was established, which would eventually become the modern city of Gifu. The city of Gifu is located in the southern portion of the prefecture and is on the northern edge of the Nobi Plain. It is also the main city of the Gifu region of the prefecture. Much of Gifus land area has been gained as the result of mergers, but the citys size grew the most through mergers with the neighboring towns of Kano (in 1940) and Yanaizu (in 2006). As a result, Gifus geography is very diverse, ranging from the built-up city center to persimmon orchards and strawberry patches in the outlying areas. The northern part of the city is bordered by tree-covered mountains, whereas most of the city center is spread throughout the southern part. The Nagara River cuts the city in half, running from the northeast to the southwest. Much of the city is part of the Nagara Rivers alluvial plain and an environmental conservation district. Because of the formation of the river, the area is prone to flooding when typhoons or heavy thunderstorms occur; however, dykes and levies have been built to control the excess water. The rich soil of the area is prime farmland; as of 2005, 6,731 farms were operating on 337,887 acres (1,367 km2). Gifu experiences a wide range of weather throughout the year. In 2005, the low temperature was ?3.8 °C (25.2 °F) and the high was 36.4 °C (97.5 °F); the average temperature was 15.9 °C (60.6 °F). That same year, the city received 1,451 millimetres (57.1 in) of precipitation, which is well below the long-term average. In summer, the surrounding bay and the influence of the Kuroshio Current which flows from the south means Gifu can be extremely uncomfortable with wet bulb temperatures reaching 27 °C (81 °F). Cormorant fishing is the representative tourist attraction of Gifu. Though it occurs in many places in Japan, cormorant fishing on the Nagara River dates back more than 1,300 years. This is also the largest display of cormorant fishing in all of Japan, with six fishing masters going down the river at the same time, using their birds to catch ayu sweetfish. The season lasts from May 11 to October 15 every year and occurs each night, except during high water levels and the harvest moon. Matsuo Basho, a renowned haiku poet in the Edo period, spent many months in Gifu, creating haiku about many things, including cormorant fishing. Famed comedian Charlie Chaplin also came to view cormorant fishing on the Nagara River twice, reportedly moved by the experience. The largest of the city-supported museums is the Gifu City Museum of History. It is located in Gifu Park and its permanent exhibit primarily focuses on Gifus past, containing many hands-on exhibits. It often hosts special exhibits, though, providing a broader field of information to its visitors. Also located in Gifu Park is the Eizo & Toichi Kato Memorial Art Museum, which is a semi-autonomous branch of the history museum. This art museum is dedicated to the works of the brothers Eizo and Toichi Kato, famous artists born in Gifu Prefecture. 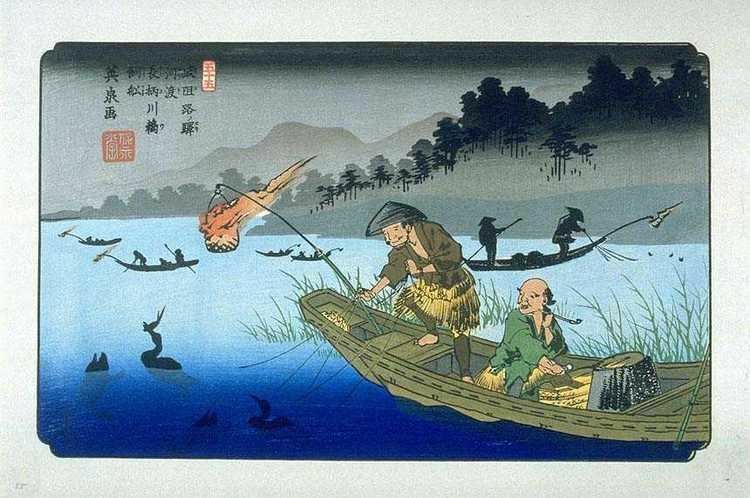 The Nagara River and cormorant fishing feature prominently in a number of their pieces. The Yanaizu Folklore Museum in the Yanaizu-cho area of the city is the other branch of the Museum of History. There are two other museums in Gifu Park, too. The Nawa Insect Museum, next to the history museum, and the Gifu Castle Archive Museum, next to Gifu Castle atop Mount Kinka. The Nawa Insect Museum was founded by Yasushi Nawa, Japans "Insect Man," in 1919, and provides a closeup look at insects and their world. Other museums include the Gifu City Science Museum and the Museum of Fine Arts, Gifu, both located near the prefectural office. In addition to the Science Museums general exhibits, it also includes a planetarium and a rooftop observatory. The prefectural Museum of Fine Arts was opened in 1982, dedicated to art and artists related to Gifu Prefecture, though it also contains pieces from around the world. In 2006 the city instituted a policy that allows elementary and junior high school students to enter many of the citys museums free of charge. 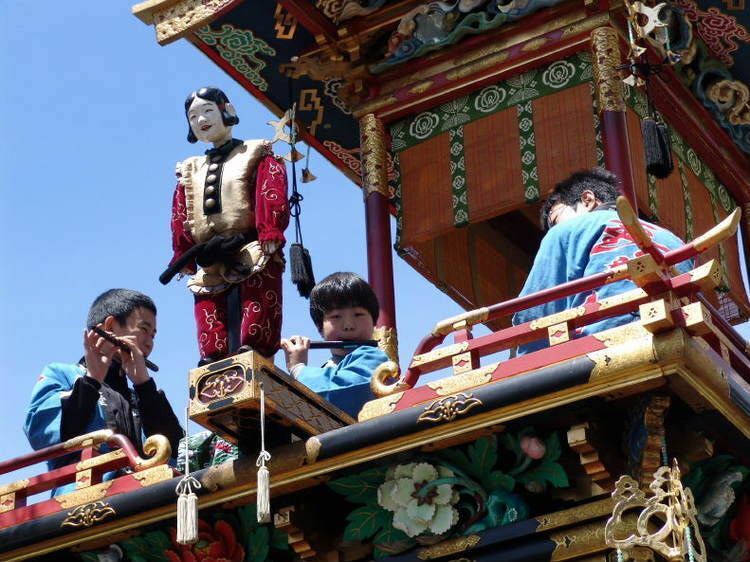 The first major festivals of the year are the Dosan Festival and the Gifu Festival, both of which occur on the first Saturday and following Sunday of April. Because the Dosan Festival is a memorial to Saito Dosan, many of the festivities take place near Jozai-ji, where his remains are buried. The Gifu Festival is a Shinto festival that begins at Inaba Shrine and winds its way through other shrines within the city. Both festivals include street vendors, flea markets, and floats paraded through the city. The Gifu Nobunaga Festival, which takes place on the first Saturday and following Sunday of October, also pays homage to a former lord of Gifu. This festival centers on the downtown area and includes a procession of horses and warriors down the citys main streets. The city also has festivals representing its cultural heritage. Twice each year, there is a Tejikara Fire Festival. It first occurs on the second Saturday of April at Tejikarao Shrine and it again occurs on the second Sunday of August at Nagara River Park. Half-naked men ring bells, and carry shrines and other devices that shoot off large sparks. Near the end of August, the city sponsors Takigi Noh, a traditional form of Japanese theater that takes place on the banks of the Nagara River, lit only by the surrounding bonfires and the fires of cormorant boats. Twice a year, Gifu plays hosts to two large fireworks festivals. Large numbers of visitors gather on the banks of the Nagara River between Nagara and Kinka Bridge to see these festivals, among the largest in Japan. The first festival, the Chunichi Shimbun Nagara River All-Japan Fireworks Festival, occurs on the last Saturday of July. The second, the Nagara River National Fireworks Display, occurs on the first Saturday of August. Approximately 30,000 fireworks are set off at each festival, with crowds of 400,000 and 120,000 visitors, respectively. The downtown area serves as the location for Flag Art Exhibitions a few times throughout the year. The flags displayed measure approximately 3 m tall by 1.8 m wide (10 ft by 6 ft). Each set of displays revolves around a different theme (such as the beauty of Gifu or AIDS Awareness) or are created by specific group of persons (for example, local school students or local artists).